resa design: Win a designer Birthday Tee from Resa Design! Win a designer Birthday Tee from Resa Design! one Resa Design product everyday this week to a blog reader. win it:: Leave a comment with your favorite birthday tee by the end of the day. (i.e. your selection if you are the winner) Be sure to leave contact information, or check back tomorrow to see if you are the winner. buy it:: 25% off Birthday Tees today only! Comment must be received by 11:59 PM, CST, on 10/6/08. Comments should include your contact information in some form. Winners will have 1 day to claim prize before we choose another winner at random. One entry per household. Winners must live in the continental USA and be able to receive first class mail. Prizes are non-transferable and may not be exchanged or returned. UPDATE: this contest is closed. Lu has been chosen at random as our winner! Happy Birthday!! Please enter me to win Olive Pink "2" in 2T Long Sleeve Jewel Neck! 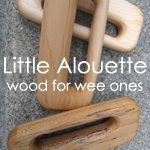 I would love a Long Sleve 12-18 months, #1, Olive Pink. My Daughter turns 1 on Nov. 12th - I hope she can wear this on her birthday! I would love to win! I have two boys and both of their birthdays are in December, so I would love to win a long sleeved No. 4 shirt in the spots design! This would be a fabulous shirt for one of my birthday boys to wear!!! :) Thanks! I would love a pear, long sleeve, 6-12 mo., girly collar. Andie turns 1 in May, but I'd love for her to be able to wear it all winter :) Happy birthday! I would love a Birthday Tee for my daughter in the following combination: Opal, 3, long sleeve, girly jewel neck, 4t. Great giveaway, thanks! Happy birthday!! 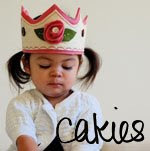 I would love to win a shortsleeve, #2 jewel neck citrus tee in a size 4T for my little girl's birthday next June. Thanks for the great giveaway! Happy Birthday! My favorite would be the "2" in blue dot in size 2T. Thanks! I would love a 2T Hot Dot Blue short sleeve with the number 2 on it for my daughter's 2nd birthday! Thanks and Happy Birthday! My son won't turn one until next June, but his cousin wore a shirt I bought from you on her bday and everyone loved it! So I hope he can wear one on his bday too! 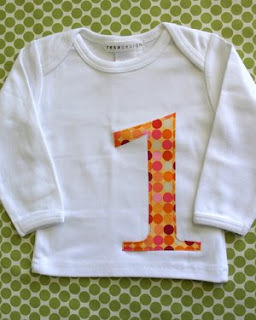 Please enter me to win Spot "1" in 12-18 months Short Sleeve Lap Tee. Happy Birthday! I would love an olive pink #5 for my big girl's 5th birthday coming not too far away!! Happy Birthday to you!! My little man hits 1 on Nov. 12th (shares a birthday with AndreaBerg's little girl!!) and he would love to wear a LONG SLEEVE 12-18 MONTHS, #1 in GREEN APPLE!! I would choose a #2 in the Citrus fabric. Size 18-24 months for my little girl! I'd love to win the "spot" design with a #2 for my little guy. Thanks for the fun giveaways and happy birthday! Happy birthday! I would love a olive pink with a number 4 in size 6 for my upcoming birthday to match my little brother's 1st birthday shirt we just ordered! 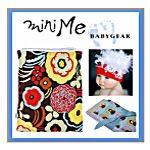 My little guy would look so cute and stylish in a 2T short sleeve, hot dot black. Happy birthday! My favorite is Olive Pink, short sleeve jewel neck. I'd love a 2 in a size 2T! A 2T long sleeve shirt with a 2 in hot dot blue would be perfect for my daughter's birthday next month! Happy bday! I would get a "2" in olive pink - 2T. 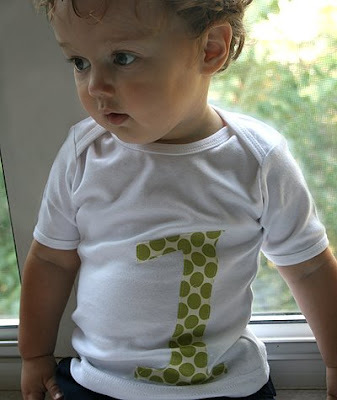 My son's first birthday is in 19 days *sob*, I'd love to get him a 12-18 month short sleeve lap tee with a "1" in spots pattern. Happy Birthday on day one. Thanks for making it oh so fun! Number 2, 2t Jewel Neck, Long Sleeve in Citrus. 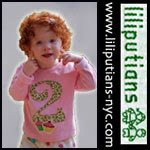 I'd LOVE a 2nd Birthday size 2T in Green Apple, long sleeve. My boys are going to be a month apart and so I hope both will be able to wear it on their birthdays. Thanks for the week of giveaways! If I were so lucky to win, I would like a : green Apple 3, long sleeve in a dude size 4T, for my soon to be 3 year old. My babe's 1st birthday is on the 23rd of this month. Would love to celebrate the day in a long sleeved, 12-18 mo., #1 in temple, jewel or lap neck. Love the hot dot blue in 1, size 12-18 months. Love rock 'n roll "2" in sz 2T! Happy Birthday! I'd love a short sleeve #2 in Hot Dot Blue size 18-24 months (girly jewel neck, of course). It would be perfect for my daughter's 2nd birthday. I love the number 1 opal long sleeve birthday tee! It's the perfect shirt to broadcast to the world my little one's age and the color is perfect as a festive birthday tee. I love the green apple. A #2 would be great for my niece whose birthday is in a few days. I would love a #2,size 2, long sleeve in spot...happy b-day!! 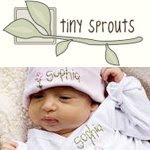 My wish would be for a #1 in olive pink, long sleeve, size 12-18 months for my daughter when she turns 1! Happy b-day!